Tom McGinty, National Director for U.S. Operations of the International Trade Administration, told Michael Killen that his organization’s series of national events on ‘Discover Global Markets: Sustainable Solutions’ helps exporters of solutions to increase sales. Sustainable solutions include advanced energy, transportation, and water solutions. The new approach concentrates ITA resources and other organizations’ resources at the locations of exporters. Previously, exporters reached out to the Administration for help. 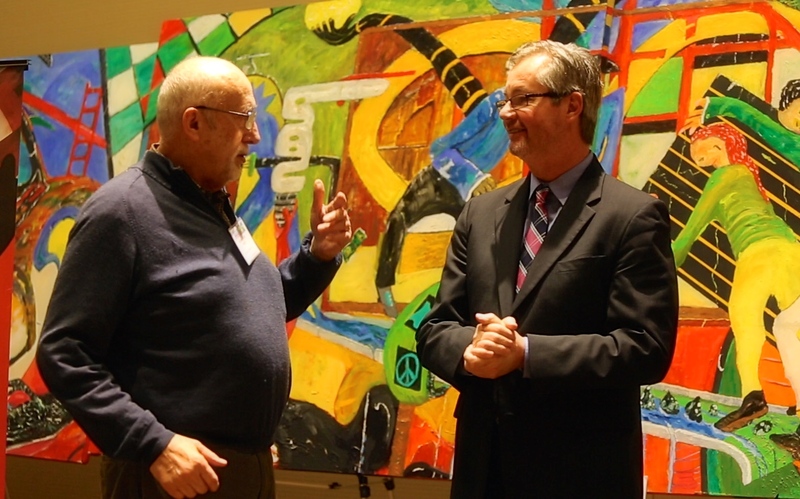 Tom McGinty (R), Michael Killen (L) with Michael’s ‘Sustainability’ (24 x 5 feet) in background at Commerce’s event. The U.S. Commercial Service, in cooperation with NASA, hosted the dynamic, business forum. The next three stops for the forum in 2015 are: Miami, FL— May 12-14; Dallas, TX—October 7-9; and Irvine, CA—November 3-5. The Department of Commerce is the third U.S. Government Agency to use Michael Killen’s art to help make their events a success. The other two are the Department of Interior and NASA. Michael@killen.com. This entry was posted in Uncategorized and tagged art, events, Exports, sustainability. commerce. Bookmark the permalink.